You might already know that here are two possible options for teeth replacement. These are dentures and dental implants. Implants are permanent and offer many advantages over dentures, but they aren’t for everyone. Implants are artificial tooth material attached to titanium posts. The posts fuse to your bone and become permanent. Implants are virtually as strong as your real teeth and they look like real teeth too. Dentures and dental implants: So, what’s the difference? Whenever possible, we recommend implants due to their superiority over dentures. · They maintain the shape of your face. A candidate for implants does need to have enough jaw bone to accept the titanium posts. Anyone who is not a candidate for implants is probably a candidate for dentures. If you do opt for dentures, Dr. Brightleaf will make well-fitting custom dentures, but with the lower denture especially, you will probably need adhesive to keep them in. Adhesive can last through the day, but before the day is over most people wind up with loose dentures that slip and can cause embarrassment, or pain if you eat something that gets caught between your dentures and your gums. The other drawback to dentures is they need to be removed to be cleaned by brushing them under running tap water with soap or special denture toothpaste. The quality of dental implants is superior to dentures and the quality of your life with implants will be too. For more information on implants and dentures, contact our Brightleaf Dental office in Santa Monica for a consultation appointment. Implants are an investment that can be saved up for like anything else. Dental implants are often not covered by insurance, but they may be, depending on your individual plan and on the cause of the lost tooth or teeth. · Discount dental plans are similar to insurance, but give you discounts on dental services for an annual or monthly fee. · Interest-free financing plans, like CareCredit, offer low monthly payments for your dental services. · Though it is rare, in some cases dental implants may be tax deductible in whole or in part. Contact Brightleaf Dental office to find out if dental implants are right for you. Dentures or dental implants: which is right for you? If you wear dentures or are considering getting them, you’re probably aware of dental implants as an alternative. Implants are permanent and offer many advantages over dentures, but they aren’t for everyone. If you’re debating dentures vs. dental implants, you should consider your health history first, and then weigh in some other factors to decide which might be better for you. Only a dentist can know for sure, but you can get some ideas from knowing a few things about the differences between dental implants and dentures. Most people are candidates for dental implants, but some people are not. This includes people with health problems like diabetes. If you have an allergy to titanium, dental implants will not work for you because they involve titanium posts. Another deciding factor is the amount of jawbone you have left. When you lose teeth, your jawbone begins to gradually deteriorate. A candidate for implants needs to have enough jawbone to accept the titanium posts. Anyone who is not a candidate for implants is probably a candidate for dentures. Whenever possible, implants are recommended due to their superiority over dentures. Why do we think implants are better? Implants are artificial tooth material attached to titanium posts. The posts fuse to your bone and become permanent. Implants are virtually as strong as your real teeth. With implants, you don’t need adhesives, special cleaners, cups or special brushes like you do with dentures. You brush them just like you brush real teeth, with gentle, non-abrasive toothpaste. No one will know your implants aren’t your real teeth. You may forget this yourself sometimes. Implants are definitely the next best thing to having your real teeth. Dentures can cause discomfort, especially if they’re ill fitting. With dental implants there’s no rubbing, no sores, and no repeat visits to the dentist for adjustments. Without the support of teeth, you will eventually lose jawbone causing your dentures to have a poor fit. Teeth are also critical in maintaining the shape of your face. Without them, the lower 1/3 of you face can become scrunched, making you look prematurely old. Only a dentist can determine if you are a candidate for dental implants or a candidate for dentures. 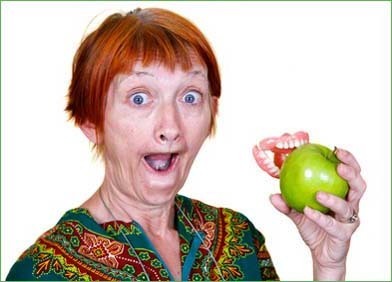 Dentures cost less and are a great improvement over having missing teeth or no teeth. For people who are candidates for implants, they offer even greater benefits than dentures. If you’re thinking about dentures or implants, call Brightleaf Dental to make an appointment for a complimentary consultation.